Synopsis: Mob attorney Nolan (Ricardo Cortez) is dead certain he's got Judge Shaw (Joe King) scared -- so scared that he's sure to acquit Nolan's underworld client. 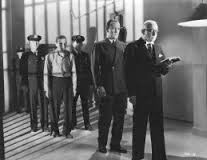 But to his surprise, Judge Shaw doesn't knuckle under, and the man is sentenced to ten years at Sing Sing. For the mob, this is intolerable. Shaw has to be taken care of, or future mob threats won't carry any weight. The trouble is, any action against Shaw will implicate Nolan and his associates. 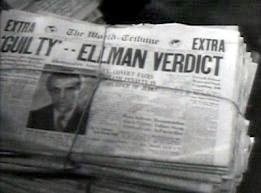 A solution is found in one John Ellman (Boris Karloff) a quiet man who's just finished a stretch in prison, thanks to Judge Shaw. Mob fixer Loder (Barton MacLane) arranges for Trigger (Joe Sawyer) to bump into Ellman, strike up a conversation, and offer him a job. Posing as a private detective, Trigger tells Ellman that Shaw's wife, suspicious of an affair, has hired him to shadow the judge. He wants Ellman to stake out Shaw's house and take notes on his comings and goings. This, of course, establishes Ellman's presence outside the judge's house for several successive nights. And on the last night Ellman returns to his car to find a body lying in the back seat -- that of Judge Shaw. But as luck would have it, a young couple -- Nancy (Marguerite Churchill) and Jimmy (Warren Hull) are passing by and witness the shady characters planting the body in Ellman's car. Soon Elman is on trial for Shaw's murder -- and just to make sure he's convicted, Nolan himself is representing the unlucky ex-con. Nancy and Jimmy debate whether to get involved in the case, knowing that the reach of the mob is quite long. In the end they decide to come forward with what they know -- but it's too late, and Ellman is executed for the crime. Comments: Hey, remember The Return of Dr. X from just a couple a weeks ago? This was the Michael Curtiz thriller that starred a miscast Humphrey Bogart in the title role. 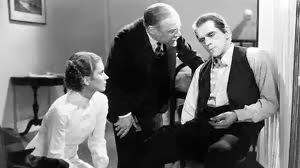 Return had been written for Boris Karloff during his three-picture deal with Warner Brothers, but by the time the script was finished Karloff had fulfilled his contract and moved on. Tonight we get to see one of the films Karloff actually made for the studio. One thing that jumps out at you about The Walking Dead is that it's definitely a Warner picture. It begins like any number of Warner crime dramas, with fast-talking mobsters, cheap gunsels, a tough-but-well-meaning D.A., and a courageous judge who refuses to knuckle under to the hoodlums who are threatening his family. 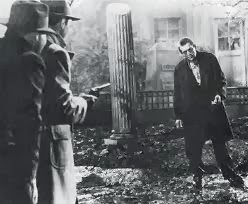 And fitting right in is Karloff himself as an unlucky ex-con, already wrongly convicted once, who's being set up to take the fall for one doozy of a murder. The only thing that can save John Ellman is the testimony of a young couple that witnessed the body being dumped into Ellman's car. So the first half of The Walking Dead ends with a race against time: will Nancy and her boyfriend step forward in time to exonerate Ellman? They do, but the person they contact isn't the D.A., but Ellman's own attorney, who wants Ellman dead. He makes sure to wait until the very last minute before contacting the D.A. Even so, it's a very near thing, and there's considerable tension as we wait for the governor's phone call, which comes only seconds too late. It should be noted that these death row scenes are very well done, and are really the high point of the movie. Upon Ellman's death, The Walking Dead changes into another picture entirely. It happens that the young lovers are scientists, assisting the kindly Dr. Beaumont with his experiments, which involve artificial stimulation of the heart. Thus Dr. Beaumont, finding out they are too late, urgently requests that the standard autopsy be suspended; he wants to try to revive Ellman using his ground-breaking technique. Ellman is successfully revived, and while he has a limp (and a shock of white hair reminiscent of Bogart's in The Return of Dr. X) he's actually doing great for a guy who had 10,000 volts run through him earlier in the day. But here's the funny thing: The Walking Dead now changes into yet another movie, shifting gears from science fiction to horror. Suddenly Ellman, fresh off the boat from the Great Beyond, now has a couple of preternatural abilities: he can recognize the men responsible for his unjust execution, even if he hasn't met them; and he has the means to punish them. His method of execution is grimly amusing: he shows up where each man happens to be (it doesn't matter where they go, he seems able to find them) and slowly limps toward them, glowering. The freaked-out hoods panic and fall out windows, or stumble onto their own firearms just as they discharge, or run out in front of moving trains. Meanwhile, Dr. Beaumont wants to quiz Ellman about what he's seen beyond the grave. He goes a bit overboard in his efforts and winds up looking like a bit of a nut; even when Ellman's dying (again) of a gunshot wound Beaumont won't stop yapping about it. Karloff turns in a great performance here as the tormented Ellman, and Ricardo Cortez is absolutely perfect as slick mob lawyer Nolan. Marguerite Churchill is a welcome presence in any movie, but unfortunately her part is so thinly written that very little of her considerable charm shows through. Edmund Gwenn's part isn't much better, but Gwenn is such a likable guy that he makes his rather pedestrian role his own. We also get to see Joe Sawyer in a small role. Sawyer was a hard-working character actor who didn't appear in much horror or science fiction; but he would do a memorable turn in Jack Arnold's It Came From Outer Space in 1953. Synopsis: George Winson (George Macready) is a famous surgeon and humanitarian who is dying in a city hospital. An accidental tear in his surgical glove exposed him to an infection, and now he only has hours to live. It seems everyone in the city has some memory of his kindness and selflessness, and it seems that everyone has joined together in mourning him. George has come to accept his fate, but his wife Ann (Jeanne Bates) is another story. She is angry that a man who has contributed so much to the world is being taken out of it before his time, while others who do evil and contribute nothing live on. George's devout friend Fred (Erik Rolf) tries to console her, telling her it is God's will, but Ann will have none of it. What God, she asks Fred, would allow such an unjust thing to happen? Either God doesn't exist or he has abandoned George; either way, she wants nothing to do with him. She then says that if any other force in the world -- the Devil, for example -- would intervene and save George, then she would owe that force her allegiance. And to prove the point, she calls out to the Devil, asking for George to be saved. At that very moment a woman in black walks along the darkened streets of the city. She never breaks stride for a moment, and walks right into the path of an oncoming car. The couple driving the car slam on the brakes, and leap out, thinking they struck her - but no one is there. 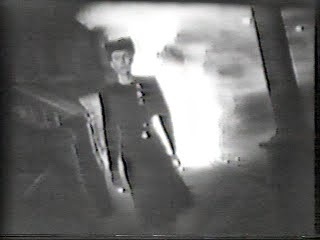 The woman in black continues walking, unconcerned at a downed powerline that is sparking only a few feet away from her. She walks into a building up to the very room where George is dying. The woman tells those assembled that her name is Lilyan Gregg and that she heard Ann's offer. Does it still stand? Ann says it does, and at the woman's word, George begins to recover. The next day the newspapers are filled with the amazing news: George Winson has made a seemingly miraculous recovery. But Fred is deeply disturbed by George's behavior. He is now distant and cold, no longer the kind and compassionate man he once was. He snarls at his faithful dog, throwing a pair of hedge clippers at it in a fit of rage. Fred later discovers that the dog has been killed, and its blood is on George's work gloves. Ann is having second thoughts too, as George displays an increasingly rude and dismissive attitude toward her. Comments: This low-key Columbia thriller is somewhat less interested in telling a story than it is in delivering a sermon, but to its credit it tries hard to be different. Lacking much in the way of budget it goes for the stylishness that Val Lewton brought to his horror films at RKO. Like most of the Lewton imitators (and there were a lot of them in the mid-40s) it doesn't entirely succeed, but it stands out as an interesting curio. As I've noted before, Ann's angry denunciation of God, and her blatant call for the Devil's assistance, is pretty daring for the 1940s. In those days religious faith, when it was discussed in films at all, was something that characters would hold onto firmly but express only in the vaguest terms. Never would a character express doubt about God's existence or intentions, even obliquely; and summoning the Devil was normally reserved for only the most corrupt and dissolute characters. It should be noted that there was nothing in the old Production Code that prohibited Soul of a Monster from taking this approach; rather, seems to have been more a concession to popular taste. The Hayes office was more concerned with language (no use of "God" or "Christ"" in any but reverent way) how the clergy was depicted (they could never be revealed to be buffoons or criminals) and how criminality was rewarded (bad guys had to get their comeuppance in the end). In the main, it was specific actions, rather than themes, that got the attention of industry censors. The Devil, as embodied by the mysterious Lilyan Gregg, appears to have an interesting m.o. Rather than going for quantity over quality, as the Devil is wont to do in books and movies, here the Devil sees an opportunity to alter the trajectory of one key do-gooder's life, thus corrupting all the people who look up to him. Most of the films we've seen on Horror Incorporated have enjoyed decent home video releases, many of them struck from restored negatives. This means that the on-screen images we see today are usually better than would have been broadcast on TV back in the 70s. But some films, like this one, were never released on home video at all. Obtaining these titles on DVD is possible, but it can be expensive, and the discs aren't usually of commercial quality. As you can see by the screen shots I've posted, the DVD I own was pulled from very poor source material; the print is so murky it looks like it was photographed from the bottom of a swimming pool, and the nighttime scenes are so dark it's often unclear what's going on. The sound is muddy and almost incomprehensible in places. But as Columbia is unlikely to invest in a restoration and video release of such an obscure title, we're lucky we have any extant copies at all. Fortunately, we haven't encountered a Horror Incorporated title that's completely lost. At least, not yet. One film, The Man Who Returned To Life, was listed as a lost film on some collector sites, but happily you can't believe everything you read on the Internet. 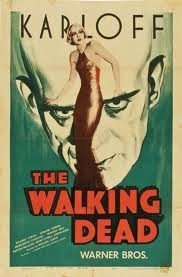 I like THE WALKING DEAD, even if the melding of Universal plot with Warners style isn't always seamless. Karloff again proves to be the gentlest of monsters, with Ricardo Cortez opposing him in his next Warners film, WEST OF SHANGHAI. 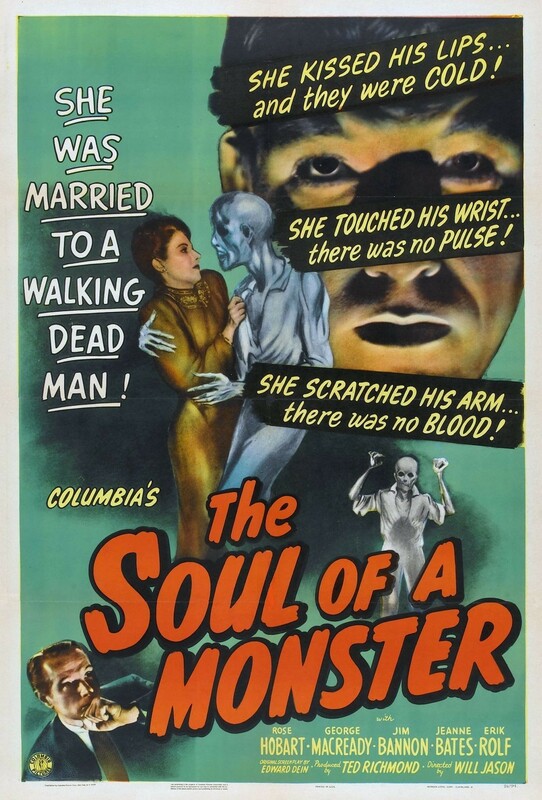 You've certainly written more about THE SOUL OF A MONSTER than anyone else ever has, or will (at least in a positive way, as Leonard Maltin's 'BOMB' review attests). 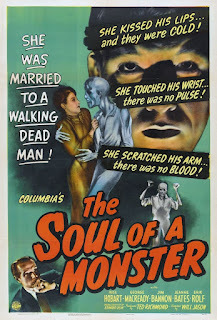 I'm still not sure if SOUL was actually a part of the SON OF SHOCK package, since it never aired on Pittsburgh's Chiller Theater like most of the other 72 titles. SOUL OF A MONSTER wasn't included in either the SHOCK! or SON OF SHOCK! package. Funny thing: by my count there are still 20 movies from the two packages that haven't been shown on H.I. Most notably MAN MADE MONSTER, WEIRD WOMAN and THE MUMMY'S GHOST.